You can’t miss the tanneries of Fes. You’ll smell them long before you set eyes on them. 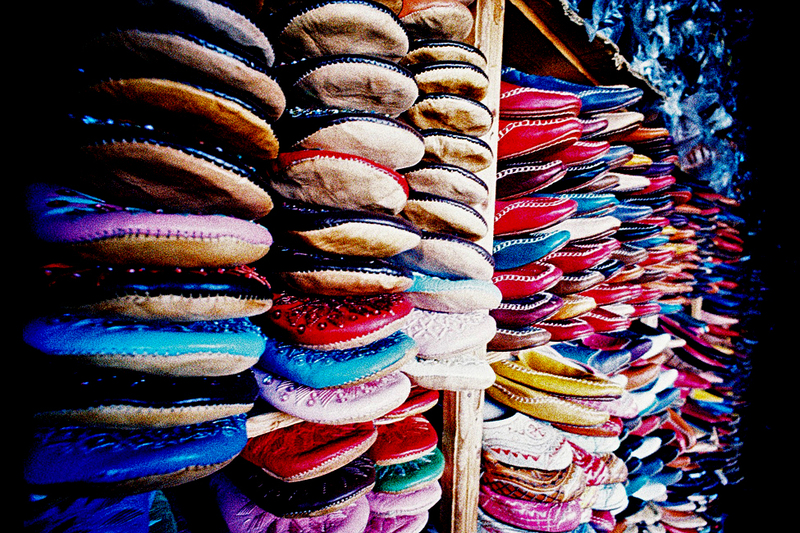 In one of Morocco’s oldest and most important cities is a leather tannery – Chouara – that dates back centuries. Here, hides are treated in a fashion that dated back to Roman times – plunged into pools of horse urine and bird droppings to soften the leather and make it more workable, and dye them. The tanning pools are a maze of different colours, each of them with hides percolating inside them. God knows what the smell is like from such close-quarters – 20 yards away, from the tannery’s shop balcony, the smell is enough to make you gag. The shop staff hand out small bunches of mint to go under your nose, but it’s of limited effect. Either you get somewhat used to the smell after a few minutes, or you head out to the sanctuary of the street. The tanneries are one of the most photographed parts of Fes, the balcony playing host to a cacophony of clicking shutters. But there are other delights within the shop. Cynics might say that the tanneries’ shop sells a range of leather goods hailing from a bit further than the tanneries in the courtyard (China, to be exact) but the spectacle is worth the visit. Where else can you see an industrial process still faithful to the way it was done hundreds of years ago. I shot this on the Lomo LC-Wide, loaded with Agfa CT100 Precisa. It’s the film that made sunny day colours pop with ludicrous saturation. Lomographers quickly cottoned on to how this cheap, consumer-grade slide film would create fantastically colourful images when cross-processed. The film hasn’t been made since 2005 but you can still find expired rolls on eBay from time to time. I’ve a stash that I save for trips like this.